I read this article and found it very interesting, thought it might be something for you. The article is called ‘It’ movie review: A creepy horror thriller and is located at http://www.panasiabiz.com/9923/it-movie-review-a-creepy-horror-thriller/. Stephen King is such a prolific author that most of his works are pretty difficult to recreate on screen as television series or movies. This became very much evident when a television series based on his bestseller “It” was aired in 1992. The series successfully captured certain aspects of the novel, but it failed to recreate the complete essence of the literary piece. Now, after 27 years, Hollywood has revisited the classic novel with Andy Muschietti on the helm. The film was released on September 08, 2017, all around the United States, and as per latest reports, it has given full justice to the ambiance created by Stephen King in his book. The film stars Jeremy Ray Taylor, Jaiden Lieberher, Bill Skarsgard, Finn Wolfhard, Jack Dylan Grazer, and Nicholas Hamilton in the lead roles. The movie is set in a small town named, Derry Maine, where a group of young kids named “The Losers Club” encounters a shape-shifting evil entity who appears every 27 years to perform gruesome murders. The history of this evil clown dates back for centuries, and in the blood hunting spree, he aims to hunt down “The Losers Club”. The major highlight of this movie is that director Andy Muschietti has captured the essence of youth pretty well throughout the proceedings. The story of the movie is purely based on the young children, and the teenagers have given full justice to the tasks assigned to them. The film would not have turned out well if the chemistry between the group of teenagers were pale. “It” is undoubtedly the most tightly packed Hollywood horror movie released in the recent past. Director Andy Muscheitti has narrated the story in a slick and engaging manner, and audiences will mostly in the edge of their seats throughout the 94 minute run time. The film is technically brilliant, and the creepy shots will surely send some chills on the audience’s spine. The only flaw which can be noted in this film is its background music, as it went slightly over the board at times. 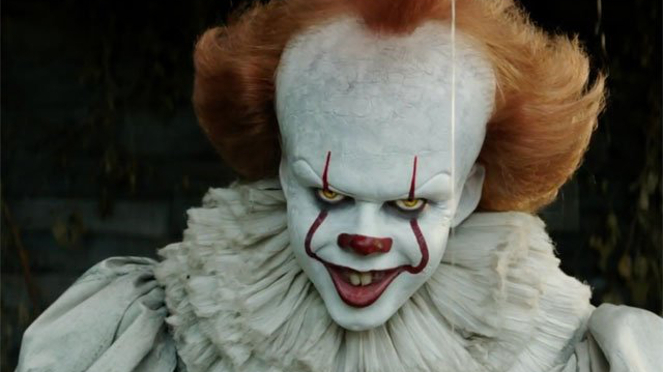 Trade experts predict an opening weekend gross of $70 million in the United States and Canada for “It”. Experts believe that this figure may even go up if the film succeeds in getting a decent ‘word of mouth’. The film is getting released simultaneously in India and other Asian countries too, and it is expected to make it big at the box-office considering the mammoth pre-release hype it gained after the trailer release.